alters the size of the Town Hall Inventory tab, now back to 3 columns wide, but with increased length. increases in size and also location of other townhall UI tab layouts. 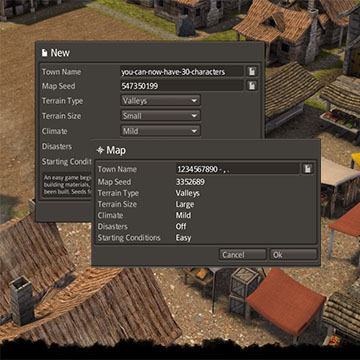 Town Names allow a maximum of 50 characters (limited to 18 in Vanilla Banished). The game toolbar width has been increased to accommodate 30 buttons (limited to 18 in Vanilla Banished). Activate the mod - Place at TOP of mod list. Pause Menu, activate the mod - Place at TOP of mod list. the mod flags as RED in Banished when using Colonial Charter, but does this is fine, and should not cause issues. - Changed Inventory tab back to 3 columns, but with increased length. - Changed other tabs to fit increased length (professions, seeds & livestock). - Text and header width changes to production tab.